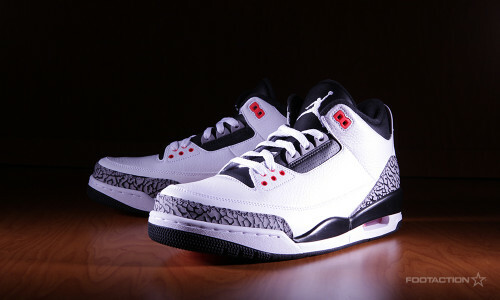 The Air Jordan 3 Retro “Infrared 23″ can be described as a study in contrast. The sneaker contains a tumbled white leather upper which pairs neatly with its black midsole, outsole, tongue, ankle collar and Jumpman logo. This model still contains its hallmark elephant print overlay on its toe and heel while hints of Infrared make an appearance on the eyelets and visible air unit. The Air Jordan 3 Retro ‘Infrared 23′ is a study in contrast. The white and black colors on the midsole and upper balance each other out. The tumbled and smooth leather combine to form the classic Jordan 3 upper. The hits of Infrared 23 offer a pop of color against the timeless elephant print. All of these elements make up another classic colorway of the Air Jordan 3 Retro. If you’re interested in copping a pair this Saturday, check out our release details below. In partnership with mall management, SELECT Foot Locker and House of Hoops by Foot Locker stores will implement a sweepstakes ticket procedure* in order to purchase the Air Jordan 3 Retro “Infrared 23″ (on sale 3/8/14 for $ 170). The sweepstakes tickets will be given out Wednesday, March 5th and Thursday, March 6th. If your ticket number is selected, you will be notified by phone on Friday, March 7th. These procedures are for SELECT STORES only. To find out which store near you will carry the shoe and if that store will implement the sweepstakes ticket procedure, please visit the Foot Locker Launch Locator. Grade school, pre-school and infant sizes will also be available. Men’s and kids sizes will go on-sale on Footlocker.com starting at 8:00 a.m. EST on Saturday, March 8th. The Jordan Six Rings, as you may know, is a hybrid of all of the sneakers Michael Jordan wore while winning his six championships. Jordan is now unveiling a new colorway: venom green. Featuring a black upper with the title on display in the shoe’s accents, lining and insole. Not to be forgotten is the classic elephant print in the mix. 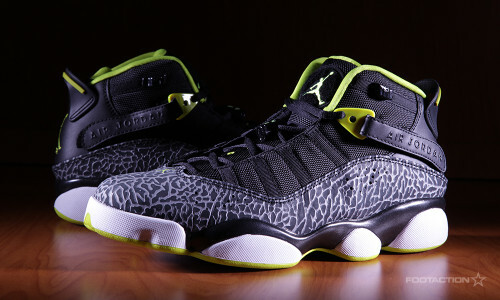 This is one sneaker in what seems to be a slew of “Venom Green” Jordan releases this weekend. We’re kicking off March with some fresh Jordan brand heat including new colorways in the Melo M10, Melo 1.5, Retro 1 ’94 and Six Rings. Check out color descriptions and pricing below. Each style will be available Foot Locker, House of Hoops by Foot Locker and Footlocker.com (starting at 8:00 a.m. EST) on Saturday, March 1st. Check the Launch Locator to see which stores will have each release. 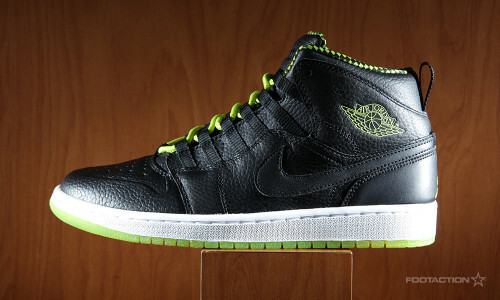 The Air Jordan 1 Retro ’94 is comprised of elements from the Air Jordan 10 and the classic Air Jordan 1. This sneaker, specifically, features a black leather based and upper, in addition to Venom Green details on the Wings logo, lining, laces and a Venom Green translucent outsole. A nice change of pace to the Jordan family. 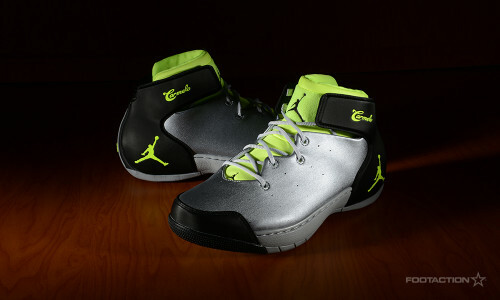 To coincide with the release of the Jordan Melo M10, is the Jordan Melo 1.5 dropping in the same “Volt” colorway. Most often seen in the original Denver Nuggets colorway, as it was Carmelo Anthony’s first signature sneaker, it now gets another rendition of the silhouette. For official names, the upper arrives in Wolf Grey, the tongue is draped in Volt, a black heel along with the “Carmelo” and Jumpman on the heel. The Jordan AJ V.2 Low is one of the best lifestyle shoes from Jordan Brand and February has brought all new exclusive colorways with it. The V.2 Low combines inspiration for the original Air Jordan 1 release with a lifestyle design and a vulcanized bottom to create a relaxed casual look. In addition to the distinctive vulcanized midsole, the V.2 Low also features the original Air Jordan logo on the heel, Michael Jordan’s #23 on the tongue, and an elephant print outsole. Each colorway you see below uses a combination of different materials, as well – from smooth leather to nubuck to canvas. The Jordan AJ V.2 Low is now available in Foot Locker stores for $ 90 in the new colorways below and more. 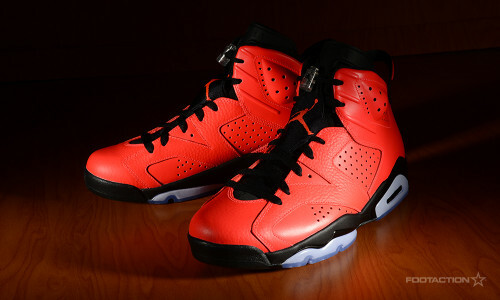 Often linked with the color ‘Infrared’, the Air Jordan 6 Retro will use it as a primary color for the shoe’s upper. Playing the more minimalist role in the Air Jordan 6 White/Infrared, it serves as an accent color. Despite how much of the color used, both of the models have become coveted classics. The new spin on the Air Jordan 6 Retro takes Infrared to the next level with an upper framed by black on the midsole, heel tab and tongue.